UConn is the first college in Connecticut and only the third school in New England to be named a Tree Campus USA by the Arbor Day Foundation. The University joins a group of almost 200 schools nationwide that have earned this distinction for their commitment to tree conservation and preservation. 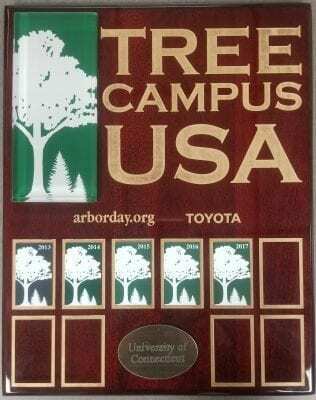 Tree Campus USA is an annual certification. UConn was first named a Tree Campus USA in 2013 and has been re-certified every year since. In 2016, UConn was presented with a GreenCircle Sustainability Award by the CT DEEP in conjunction with the Hartford Business Journal. 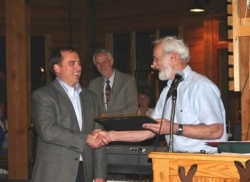 The GreenCircle Award Program was established in 1998 to recognize Connecticut businesses, institutions, individuals, and government entities who have gone above and beyond to reduce energy and climate change, water usage, improve waste management and recycling, as well as sustainable civic improvements and innovations. The GreenCircle award came in recognition of UConn’s many diverse sustainability initiatives and projects to reduce its environmental footprint, consistent with UConn’s Climate Action Plan (CAP).To date, UConn has registered or certified 23 LEED projects (2.2 million sq. ft.) at the main Storrs campus, including 3 LEED Gold-certified buildings. Also, four of UConn’s dining halls are Green Restaurant Certified for serving local organic and third-party verified food and for reducing water, energy, and food waste. UConn also strives to reduce emissions from transportation. In 2015, Rec Services implemented a new Cycle Share program that enables use of bicycles for a week, month, or semester for anyone with a UConn ID, at a nominal cost. In addition, two new electric vehicle (EV) stations are free for use by commuters, and will help power UConn’s fleet that is already 15% hybrid or EV. 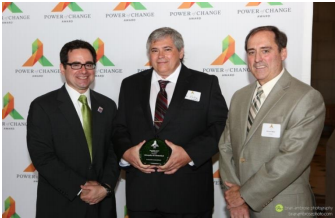 In 2014, UConn was awarded a Power of Change award for major energy efficient improvements made to the George J. Sherman Family Sports Complex. The upgrade for the athletic facility includes a new automated lighting system that uses fewer fixtures and less electricity enabling it to reduce light pollution and glare while still providing NCAA compliant lighting. In addition, an advanced 24-hour control and monitoring function enables personnel to turn off the system remotely when not in use. The new lights contributed to a reduced energy usage in the complex by 187 kilowatt hours per light bulb, resulting in a 55% reduction in energy use. All of these new features have not only made the complex Dark Skies Compliant with a 50% reduction in light pollution but also they have provided a learning opportunity through UConn's "Living Laboratory" for sustainability education. The 2014 Sustainability Awards “annually recognize and honor member institutions that have demonstrated outstanding leadership in the promotion and implementation of environmental sustainability, specifically as it relates to campus dining operations,” according to the organization’s website. UConn was recognized for forward-thinking programs in materials and resources during the McMahon Dining Hall renovation. At the first annual Power of Change Award ceremony sponsored by the Common Sense Fund, the Hampshire Foundation, and the Emily Hall Tremaine Foundation, the University of Connecticut’s Office of Environmental Policy project team received the Power of Change Top Building Award for McMahon Dining Hall for innovative and effective efficiency efforts. 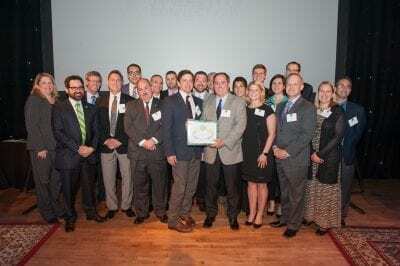 A total of seven state energy efficiency projects including the University of Connecticut were celebrated as models for future projects. In 2012, the University of Connecticut received the Institutional Honor Award from the Connecticut Green Building Council at its Green Building Awards ceremony for the newly built Laurel Hall (formerly the Classroom Building). The new academic building boasts energy efficient lighting, high-performance insulation, natural lighting, and a green roof to reduce run off and cut down on heating and cooling costs. Laurel Hall also has energy-saving window glazing, low-flow valves and faucets, and was built using rapidly renewable materials such as bamboo and recycled copper. On the outside, Laurel Hall is surrounded by porous pavers to encourage water infiltration and a bioretention swale full of drought-resistant and adaptable plants that capture and remove contaminants from runoff. 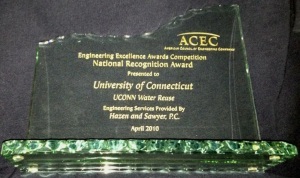 The University of Connecticut was awarded the Engineering Excellence Award by the American Council for Engineering Companies in April, 2010 for the reclaimed water facility's water reuse and engineering services. 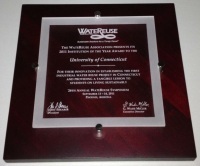 It was also awarded the 2011 Institution of the year award by the Water Reuse Association at the 26th annual WateReuse Symposium for its innovation in establishing the first industrial water reuse project in Connecticut and providing a tangible lesson to students on living sustainably. The Reclaimed Water Facility provides tertiary treatment of effluent from the University's adjacent sewage treatment plant and pumps the reclaimed water directly to our central utility plant/CoGen facility, for use as cooling water, and to certain athletic fields, for irrigation purposes. The treatment process uses microfiltration and ultraviolet disinfection, which will allow UConn to divert a maximum of 1 million gallons of non-potable – not drinkable – water each day to meet the aforementioned campus needs that don’t require fresh water. One of these needs is for the CoGen power plant, which uses anywhere between 250,000 and 450,000 gallons of cooling water each day, which is currently done using potable water. The reclaimed water facility will allow the University to use the treated non-potable water to meet this need instead, replacing the need to pump and treat hundreds of thousands of gallons of potable water from our two major water supply well fields. The RWF is expected to be constructed and operational by December 2012/January 2013. 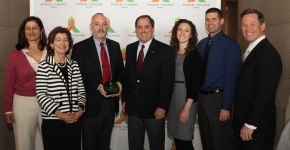 UConn's Environmental Policy Advisory Council (EPAC) and the Office of Environmental Policy (OEP) were selected as the recipient of a community environmental leadership award in the group category by Joshua's Trust, the regional land trust based in Mansfield and one of the largest and most influential local environmental organizations in the state. More than 50 faculty members, staff, and student and alumni representatives have served as members of EPAC over the years since its creation in 2003. Members are appointed by President Hogan and Provost Nichols to one- and two-year terms, and the group is advisory to senior administration. 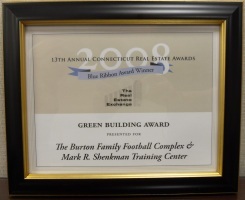 In the 13th annual Connecticut Real Estate Awards held by The Real Estate Exchange in 2008, the Burton Family Football Complex and the Mark R. Shenkman Training Center received the Green Building Award. As a LEED Silver athletic facility, the complex is full of environmentally friendly features including an innovative infrared radiating heating, renewable flooring, and environmental furnishings. The building also has an advanced water management system which includes low flow shower heads and dual flush toilets. From the exterior, the complex is surrounded by rain gardens, bioretention swales, reinforced porous surfaces, and exterior lighting that reduces light pollution from the building at night. The Burton Family Football Complex and the Mark R. Shenkman Training Center will be a state-of-the-art, environmentally friendly athletics hub at the Storrs campus for many years to come.